as an art student, Soviet painter Fyodor Pavlovich Reshetnikov was employed as an "artistic reporter" on an Arctic expedition aboard the doomed Chelyuskin steamship? the Jensen Arctic Museum in Monmouth, Oregon, is the only museum on the West Coast other than in Alaska that focuses solely on Arctic culture? the Ziegler Polar Expedition was stranded in the arctic for two years until it was rescued in 1905? Capt. Robert Bartlett skippered the schooner Effie M. Morrissey to the Arctic 20 times in the name of science and research? Indre Wijdefjorden National Park contains the only High Arctic steppe vegetation in Europe? John Wilson Danenhower, survivor of an Arctic expedition whose ship was crushed by ice, later committed suicide due to the grounding of the ship which was to be his first command? Tookoolito (pictured) and her companion were advertised as "Esquimaux Indians... from the arctic regions" and exhibited at Barnum's American Museum in 1862? Charles R. Stelck proved that ancient coral reefs had once existed in the Arctic and that oil could be found there? The Arctic region can be defined as the area north of the Arctic Circle (66° 33’N), which is the approximate limit of the midnight sun and the polar night. Alternatively, it can be defined as the region where the average temperature for the warmest month (July) is below 10 °C (50 °F); the northernmost tree line roughly follows the isotherm at the boundary of this region. Socially and politically, the Arctic region includes the northern territories of the eight Arctic states, although by natural science definitions much of this territory is considered subarctic. Arctic vegetation is composed of plants such as dwarf shrubs, graminoids, herbs, lichens and mosses, which all grow relatively close to the ground, forming tundra. As one moves northward, the amount of warmth available for plant growth decreases considerably. In the northernmost areas, plants are at their metabolic limits, and small differences in the total amount of summer warmth make large differences in the amount of energy available for maintenance, growth and reproduction. Colder summer temperatures cause the size, abundance, productivity and variety of plants to decrease. Trees cannot grow in the Arctic, but in its warmest parts, shrubs are common and can reach 2 m (6 ft 7 in) in height; sedges, mosses and lichens can form thick layers. In the coldest parts of the Arctic, much of the ground is bare; nonvascular plants such as lichens and mosses predominate, along with a few scattered grasses and forbs (like the arctic poppy). The Arctic includes sizable natural resources (oil, gas, minerals, forest—if the subarctic is included—and fish) to which modern technology and the economic opening up of Russia have given significant new opportunities. The interest of the tourism industry is also on the increase. The earliest inhabitants of North America's central and eastern Arctic are referred to as the Arctic small tool tradition (AST) and existed circa 2500 BC. AST consisted of several subsets, including Independence culture and Pre-Dorset culture. The Dorset culture (Inuktitut: Tuniit or Tunit) refers to the next inhabitants of central and eastern Arctic. The Dorset culture evolved because of technological and economic changes during the period of 1050-550 BC. With the exception of the Quebec/Labrador peninsula, the Dorset culture vanished around 1500 AD. Supported by genetic testing, evidence shows that Dorset culture survived in Aivilik, Southampton and Coats Islands, until the beginning of the 20th century. Dorset/Thule culture transition dates around the 9th-10th centuries. Scientists theorize that there may have been cross-contact of the two cultures with sharing of technology, such as fashioning harpoon heads, or the Thule may have found Dorset remnants and adapted their ways with the predecessor culture. Others believe the Thule displaced the Dorset. By 1300, the Inuit, present-day Arctic inhabitants and descendants of Thule culture, had settled west Greenland, and moved into east Greenland over the following century. Over time, the Inuit have migrated throughout the Arctic regions of Canada, Greenland, Russia and the United States. Other Circumpolar North indigenous peoples include the Chukchi, Evenks, Inupiat, Khanty, Koryaks, Nenets, Sami, Yukaghir, and Yupik. The Arctic region is a focus of international political interest. International Arctic cooperation got underway on a broad scale well over ten years ago. The International Arctic Science Committee (IASC), hundreds of scientists and specialists of the Arctic Council, the Barents Euro-Arctic Council and its regional cooperation have compiled high quality information on the Arctic. No country owns the geographic North Pole or the region of the Arctic Ocean surrounding it. The surrounding Arctic states that border the Arctic Ocean — Russia, Norway, the United States, Canada and Denmark (via Greenland)—are limited to a 370 kilometre (200 nautical mile) economic zone around their coasts. Upon ratification of the United Nations Convention on the Law of the Sea, a country has ten years to make claims to extend its 200 mile zone. 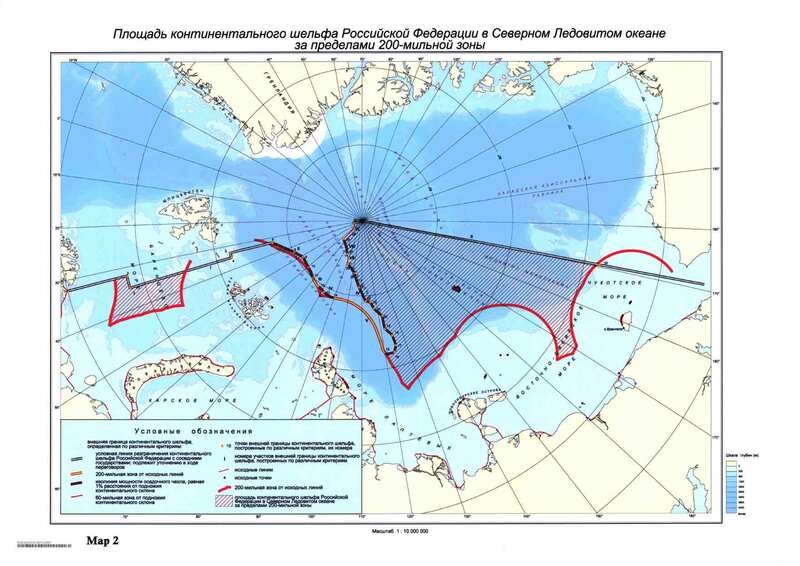 Due to this, Norway (which ratified the convention in 1996), Russia (ratified in 1997), Canada (ratified in 2003) and Denmark (ratified in 2004) launched projects to establish claims that certain Arctic sectors should belong to their territories. In September 2008, the extent of the summer Arctic ice cap was at a near-record low, only 9 percent greater than the record low in 2007, and 33.6 percent below the average extent of sea ice from 1979 to 2000. The current Arctic shrinkage is leading to fears of Arctic methane release. Release of methane stored in permafrost could cause abrupt and severe global warming, as methane is a potent greenhouse gas. On millennial time-scales, decomposition of methane hydrates in the Arctic seabed could also amplify global warming. Previous methane release events have been linked to the great dying, a mass extinction event at the boundary of the Permian and Triassic, and the Paleocene-Eocene thermal maximum, in which temperatures abruptly increased. The National Oceanic and Atmospheric Administration's Arctic Report Card presents annually-updated, peer-reviewed information on recent observations of environmental conditions in the Arctic relative to historical records. In 2008, there continues to be widespread and, in some cases, dramatic evidence of an overall warming of the Arctic system. ^ Addison, Kenneth (2002). Fundamentals of the physical environment. Routledge. p. 482. ^ Hansen, Jim (October 19, 2006). "The Planet in Peril – Part I". Yale Center for the Study of Globalization. http://http://yaleglobal.yale.edu/content/planet-peril-%E2%80%93-part-i. ^ a b Serreze, Mc; Holland, Mm; Stroeve, J (Mar 2007). "Perspectives on the Arctic's shrinking sea-ice cover". Science (New York, N.Y.) 315 (5818): 1533–6. doi:10.1126/science.1139426. PMID 17363664. ^ Hoffecker, John F. (2005). A prehistory of the north: human settlement of the higher latitudes. Rutgers University Press. pp. 130. ISBN 0813534690. http://books.google.com/books?id=_rL5F4EAaFkC&pg=PA132&dq=pre-dorset+culture&ei=p385S_DnNJDSyQST5MmECQ&client=firefox-a&cd=2#v=onepage&q=pre-dorset%20culture&f=false. ^ Gibbon, Guy E.; Kenneth M. Ames (1998). Archaeology of prehistoric native America: an encyclopedia. Volume 1537 of Garland reference library of the humanities. Taylor & Francis. pp. 28-31. ISBN 081530725X. http://books.google.com/books?id=_0u2y_SVnmoC&pg=PA29&dq=%22dorset+culture%22&ei=3Es4S_kToK7IBIyirbYB&client=firefox-a&cd=1#v=onepage&q=%22dorset%20culture%22&f=false. ^ McGhee, Robert (2005). The last imaginary place: a human history of the Arctic world (Digitized Oct 7, 2008 ed.). Oxford University Press. pp. 55. ISBN 0195183681. http://books.google.com/books?id=NdaAAAAAMAAJ&q=sagdlermiut+genetic&dq=sagdlermiut+genetic&ei=0Zg5S8uVE5SuyAS2qLjLAQ&client=firefox-a&cd=1. ^ "Conference in Ilulissat, Greenland: Landmark political declaration on the future of the Arctic". Ministry of Foreign Affairs of Denmark. 2008-05-28. http://www.um.dk/en/servicemenu/news/newsarchives2008/conferenceinilulissatgreenlandlandmarkpoliticaldeclarationonthefutureofthearctic.htm. Retrieved April 30, 2009. ^ "North Pole drifting stations (1930s-1980s)". Woods Hole Oceanographic Institution. http://www.whoi.edu/beaufortgyre/history/history_drifting.html. Retrieved April 30, 2009. ^ Arctic Climate Impact Assessment (ACIA). Impacts of a Warming Arctic: Arctic Climate Impact Assessment. Cambridge University Press, 2004. ^ "Catlin Artic Survey - Science and Expedition Summary". Catlin Arctic Survey. http://www.catlinarcticsurvey.com/assets/downloads/CAS%20Science%20and%20Expedition%20Summary.pdf. ^ "Global Sea Ice Extent and Concentration: What sensors on satellites are telling us about sea ice." National Snow and Ice Data Center. Retrieved May 1, 2009. ^ National Oceanic and Atmospheric Administration (NOAA). Arctic Report Card. Updated annually. This article is for quotes about the Arctic, the region around the Earth's North Pole. The Arctic includes the Arctic Ocean (which overlies the North Pole) and parts of Canada, Greenland (a territory of Denmark), Russia, the United States (Alaska), Iceland, Norway, Sweden and Finland. To seek brave lost in Arctic snows and seas! There are two kinds of Arctic problems, the imaginary and the real. Of the two, the imaginary are the most real. Far to the North under the Great Bear, Sápmi shines. Ridge upon ridge, lake stretching into lake. Rocky cliffs, craggy peaks point to the sky. Steely precipices drop, descend into the stormy sea. The fiery skies of the winter, the summer nights' miraculous sun. Walk against the wind. Climb mountains. From Old French artique (with -c- reintroduced after Latin in the 17th century), from Latin arcticus, from Ancient Greek ἀρκτικός (“‘northern, of the (Great) Bear’”), from ἄρκτος (“‘bear, Ursa Major’”). Arabic: أركتيك ar(ar) ('arktiik), القطب الشمالي ar(ar) (al-quTb al-shmaaliy) m.
Bulgarian: Арктика bg(bg) (Árktika) f.
Macedonian: Арктик mk(mk) (Árktik) m.
Russian: Арктика ru(ru) (Árktika) f.
Of or pertaining to the Arctic. The Arctic is the area around the Earth's North Pole. The Arctic includes parts of Russia, Alaska, Canada, Greenland, Lapland and Svalbard as well as the Arctic Ocean. It is an ocean, but it is always frozen, so it is solid ice. Most scientists call the area north of the treeline Arctic. Trees will not grow when the temperatures get too cold. The forests of the continents stop when they get too far north or too high up a mountain. (It gets colder as you go higher in altitude, too.) The place where in the trees stop is called the treeline. The area north of the treeline is not an empty ice field. In fact, the only ice-covered land is central Greenland, which is covered year-round by a continental glacier. The land of the Arctic is around the edges of the Arctic Circle and is usually covered with tundra. A tundra is a cold, almost treeless plain covered with moss and grasslike plants called sedges. Tundras do not get very much rain or snow. However, they are very wet in the summer time because, three feet or so below the surface, the ground is always frozen. This permafrost is a layer of ice with the hardness of stone that keeps water from soaking into the earth beneath it. Permafrost can be thousands of feet thick. In the summer the ground on top thaws out when the sun shines and the snow that did fall melts. But the melted snow cannot drain into the ground; it just soaks the topsoil. There is no place for the water to go, except to form lakes and puddles on top of the ground until it freezes again or dries up. In some parts of the Arctic the ground is covered with bright-colored flowers during the short summer. These little plants have very short stems. They must stay close to the ground, because the earth is warmer than the biting winds that blow above it. Even some rocks have plants growing on them.These rock plants are called lichens. Lichens will grow on the bare rocks. Yellow reindeer moss is really a lichen. It grows slowly, but often grows over six inches (15 cm) tall. It is spongy and full of water. This plant is the summer food for reindeer. Trees are almost seen on the tundra. Only in the protected valleys or along the riverbanks are small trees able to grow. Rivers come into the Arctic from the warmer south. The places along their banks are a little bit warmer than the rest of the tundra. This means trees can grow there. 0therwise only a few clusters of bushes grow sparingly. Berries are the only fruit that grows in the Arctic. Each summer the ice and snow will melt, allowing the animals to find food and the plants to flower. The moisture from the snow stays toward the top of the ground's surface. Plant roots can use it for their growth. Even so, in many places the soil is too poor for plant's growth. Less than half of the tundra has plants growing on it. The polar bear is the world's largest meat-eating land animal. Polar bears were perfectly designed to hunt seals out on the ice. They are excellent swimmers, and the coldest water does not bother them. They just jump into any leads that open in the pack ice and swim across. They are quiet enough to sneak up on a sleeping seal and strong enough to kill it with one blow. They have a very strong sense of smell, which they use to find prey out on the ice. Polar bears live most of their lives out on the pack ice. Males go to the land only when the ice is gone. The females, however, will dig themselves into a den of snow on land for the winter. There, the mother bears have their cubs, usually twins. Bears usually eat fish, birds' eggsd, seaweed, and dead whales, but they would rather have a meal of seal or walrus. The Arctic fox will often trail the bears onto the ice to eat their leftover food. The fox also eats rabbits, lemmings, and voles. The lemmings and voles are the rats and mice of the Arctic. The lemmings have very short tails. They live underground in summer. Because the top soil freezes in the winter, they cannot burrow underground then, so they live under the snow during the colder months. They eat plants and roots. If they find plenty of food, they wil have extra large families that year. In a year with plenty of food, millions of lemmings will be roaming the tundra. The owls and foxes have more food than they can eat. They will have extra babies in they years when there are so many lemmings. However, the tundra does not have enough food for millions of lemmings. They rush across the tundra looking for food, and are eaten by predators or starve to death. Some try to swim across lakes or rivers and drown. The few that remain continue to have families. Caribou and their relative, the reindeer, live in the Arctic too. The caribou are now found mostly in North America, and they are larger than the reindeer. Large herds feed on the grass and lichens. When fall comes,s they move south to winter feeding grounds. They dig through the snow with their sharp hoofs for food. Their hollow fur creates a cushion of air around them that helps them to stay warm. In the spring they return north to the summer pastures, where their calves are born. An hour or so after being born, the calves are able to follow the herd toward the Arctic Ocean. Most of the world's reindeer live in Europe and Asia. Some of these reindeer are not wild. They have been tamed by herdsmen who protect them from wolves and lead the migrations each spring and fall. Also, the musk ox, which looks like a shaggy buffalo, lives in the Arctic. In summer, many birds visit the Arctic, and most of them are water birds, such as geese, ducks, swans, loons, and Arctic terns. Flying in for the summer, they raise their young and return south for the winter. The snowy owl and the ptarmigan stay all year. The color of the snowy owl matches the snow. The ptarmigan's summer feathers change to white when it gets colder. But the best known of the Lapp people were the nomads who raised reindeer. The Lapps survived iin their harsh homeland by domesticating the reindeer. The Lapps were able to get everything they needed from the deer. They ate mostly meat, milk, and cheese. Their clothes were made froom reindeer skins and wool. Their tents were also made from deer skins. They are known for the beautifully decorated woolen clothing they made. The Lapps protected the herds, moving with them as they migrated from summer to winter pastures. They used trained reindeer to pull sleds carrying their supplies. During the winter, the herds moved south of the treeline. The Lapps would live nearby in homes made of logs or sod. The Lapps were very careful not to waste anything they got from the reindeer. Milk was taken from the reindeer to drink or make cheese. Meat was taken for food. The blood was frozen in chunks and used for soup and pancakes. Knives and belt buckles were carved from the bones and antlers. The sinews were used as sewing thread. Cleaned-out stomachs wer eused to carry milk or cheese. Every part of a dead reindeer was used. Winter clothing was made from layers of deer skin. The inside layer would be worn with the fur facing in toward the person's skin. The second layer was worn with the fur facing out. Boots were also made of fur, lined with grass that had been gthered during the short summer. Every evening the grass would be taken out and dried by the fire, so it would be ready to use again the next day. Thus, a Lapp could be warm and comfortable in even the coldest weather. Eskimos are Arctic people, too. They ate raw meat. Eskimos were also nomads, but they did not have any animals except for dogs, which they used for pulling their sleds and helping them hunt. They were hunters and gatherers, and they lived off on whatever they found or killed. Like the Lapps, though, they were very careful to maek good use of every part of the animals they killed. Eskimos lived in tents during the summer, and sod houses or igloos in the winter. The Eskimos made very clever things from the bones, antlers, and wood they had. They invented the harpoon, which was used to hunt, and they built boats. Eskimos did not have a government or laws, because they learned early in life to help each other in order to survive. Always sharing food, they usually moved around in small groups looking for food. Sometimes they'd get together in a large group when they hunted big animals such as whales. The men did the hunting and building the homes, and the women cooked, made the clothes, and took care of the children. The oil in Alaska, for example, is very important to the United States. The main source of the oil is near Prudhoe Bay on Alaska's north coast. It was discovered in 1968. Plans were quickly made to build a pipeline to bring the oil to an ice-free port so it culd be shipped south. Oil companies spent billions of dollars to build the Trans-Alaska Pipeline in the mid-1970s. It had to be built above the ground in the northern section because of the permafrost. The warm oil in the pipies could have melted the permafrost and caused the ground to sink. That would have broken the pipes and caused an oil spill. The pipeline was completed in 1977. It brings oil to the seaport of Valdez on Alaska's south coast. From there the oil is taken by huge tankers to refineries along the west coast of the United States. If you live in western America, your family car may have Alaskan gasoline in its tank. Russia has more land in the Arctic than any other nation. The Russian Arctic in Asia and the area just south of it are called Siberia. It is such an empty, harsh place that it has been used as a enal colony for many years. The old Russian rulers and the modern communist Soviets would send criminals and people who disagreed to the government to live there. However, many people were also sent there to remove minerals, harvest trees from forests, and build cities. Russia has a huge port city right in Lapland, within the Arctic Circle. Murmansk is the largest city north of the Arctic Circle. The port is kept ice-free by the warm waters of the Gulf Stream coming up around Norway and Sweden froom the South Atlantic. Huge icebreakers work to keep a path open so ships can reach the port. The port ships out fish, minerals, and lumber to Russia and the rest of the world. The Arctic is also the shortest way for airlines to fly between some cities on different continents. The flight from London to Tokyo, for example, is 1,400 miles shorter if flown across the top of the world instead of the old route south across Europe and Asia. The polar route from San Francisco to Norway is several hours shorter than the same flight going across the United States and the Pacific Ocean.